The most popular quilt from last week was from http://fabricengineer.blogspot.com you can click on the link to go to their blog or click on the image to go to the post about this quilt it is named Quilt 11. I can understand the simplicity of a name like that. I totaly love how it was done it is pretty cool and even the back has a block up on end in it also. Starting this month and going forward I would like to add a give away with my Link A Finish Friday. It is amazing that I have been doing this now for 19 weeks in a row. I have not yet picked exactly the prize for this month but Tanya and I have decided it will be in the size range of a couple fat quarters a month. This is from my personal stash. Most likely I will offer 2 different selections to the winner and let them pick. So 1 winner 2 fat quarters. 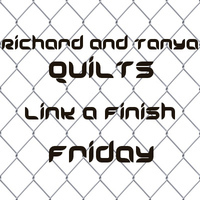 To be entered you have to link up a finished quilt or a quilt in progress quilt (yes I know its a link a finish Friday but see rule number 1 below) Thank you to all those that have participated in the past and I hope even more in the future. I know it's not a quilt (so that means I won't be in the drawing--shoot!) but I still want to show off something I just finished. It was a commissioned piece and I got it done in record time (with great results). I actually did finish a quilt this week! yaay! Great idea, thanks! I'm linked! 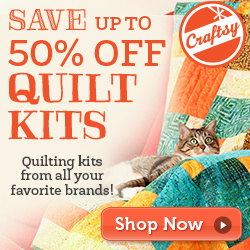 I was so excited to see my quilt featured...thanks! !